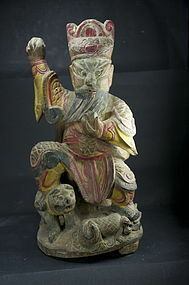 Statue of God Hung Hsien Tati, China, 19th C.
Please refer to our stock # 1-0821 when inquiring. Statue of God Hung Hsien Tati, a protector, also called The Great Emperor, The Immortal, in military garb, holding a bowl in his left hand. He was probably holding a sword in his right hand, but the sword is now missing. The god's right foot is resting on his tiger, while his left foot is resting on a dragon. Votive box (open) at the back. Polychrome wood. China, 19th century. Height: 14 1/4" (36 cm). Good condition. Statue of Chao Kung Ming, China, 19th C. Statue of Zhen Wu, God of the North, China, Ming Dyn. Statue of Chao Kung Ming, God of Wealth, China, 19th C.